And at David Dexters one of the first faces you will see belongs to Ben Collins, our Assistant Service Manager. He is the person that will reassure you that not only is your vehicle in safe hands, but you are too. Ben has worked at David Dexters for just over a year but his experience in the motor industry began more than five years ago, working for a variety of garages including Landrover. As well as meeting and greeting our customers Ben has the all important job of putting out our David Dexters flag (he describes it as a VERY important part of his role!). “It’s part of my job because I am here early and I am the one that makes sure we are all set up and ready for our first customer,” says Ben. Another important part of Ben’s job role is his smile! “I greet all customers courteously and with a smile – if it is a customer’s first time at David Dexters I want to make them feel welcome and reassure them that their vehicle is in good hands, and a smile is the best way to start that trust,” added Ben. “We have a lot of regular customers, lovely customers that know we look after them. “David Dexters has a great reputation and people are not intimidated by us – which I think can happen when people are dealing with garages. 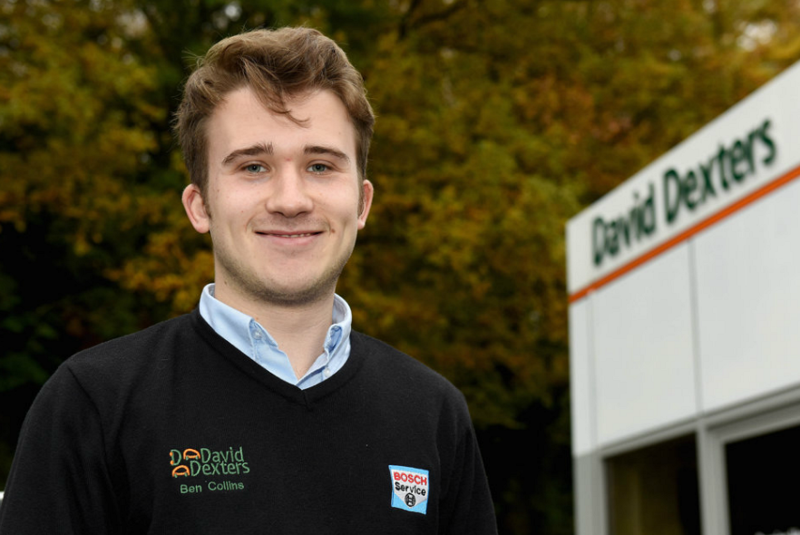 At David Dexters we focus on customer service right across our business, in the workshop, in our busy sales department, and on our front desk – where you will find Ben, ready to greet you.